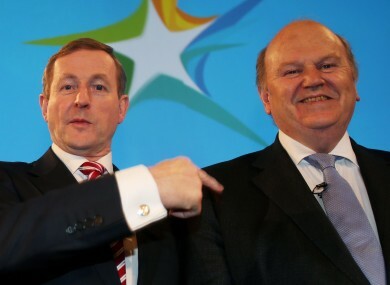 MICHAEL NOONAN AND his government colleagues have been accused of having “disdain” for the poor after the finance minister claimed there were people who would never take up jobs because they were “allergic to work”. He made the comments to a group of business leaders as he outlined the government’s plans for job creation. “Before very long, everybody in this country who wants to work, or the kids who are emigrating now, if they want to stay at home, we want there to be a job for them,” Noonan told a Kilkenny Chamber of Commerce lunch. Earlier, Sinn Féin senator Kathryn Reilly said it was “absolutely outrageous” Noonan believed there were people in Ireland who didn’t want to work, although she said the comments were typical of the government’s attitude. “Fine Gael and Labour have shown time and time again utter contempt for those on low incomes, those people who have been hit hardest by the recession and those from marginalised backgrounds,” she said. The latest Live Register figures show the number of people signed up for unemployment payments fell to 343,551 in April – down 11.5% from the 388,559 on the dole at the same time in 2014. The number of long-term claimants fell by a similar share to 158,488, while the seasonally-adjusted unemployment rate held steady at 10%. Fianna Fáil jobs spokesman Dara Calleary said Noonan’s comments were insulting and offensive to those genuinely trying to get back into the workforce, especially those in regional areas. These people are not ‘allergic to work’ – they have been left behind by the government’s failure to implement balanced regional development,” he said. The government’s latest jobs forecasts, taken from its spring statement, shows it expects the jobless rate to average 9.6% this year and slowly fall to 6.9% in 2020. Those predictions appear to contradict its stated target of full employment by 2018, when the government currently expects an average unemployment rate of 7.8%. Brid O’Brien, from the Irish National Organisation of the Unemployed (INOU), told TheJournal.ie the finance minister’s comments were “not helpful, to say the least”. She said the INOU was worried the government wasn’t serious about targeting structural unemployment and getting marginalised groups like the elderly, disabled and minorities into jobs. Figures released by Eurostat today showed the employment rate in Ireland as a share of the total population aged 20 to 64 was 67% last year, below the EU-wide average of 69.2%. That means about a third of the country’s working-age population are currently out of the workforce, compared to a low of only 20% in Sweden and a high of nearly 50% in Greece. Email “Michael Noonan is copping a lot of flak for saying some people are 'allergic to work'”. Feedback on “Michael Noonan is copping a lot of flak for saying some people are 'allergic to work'”.